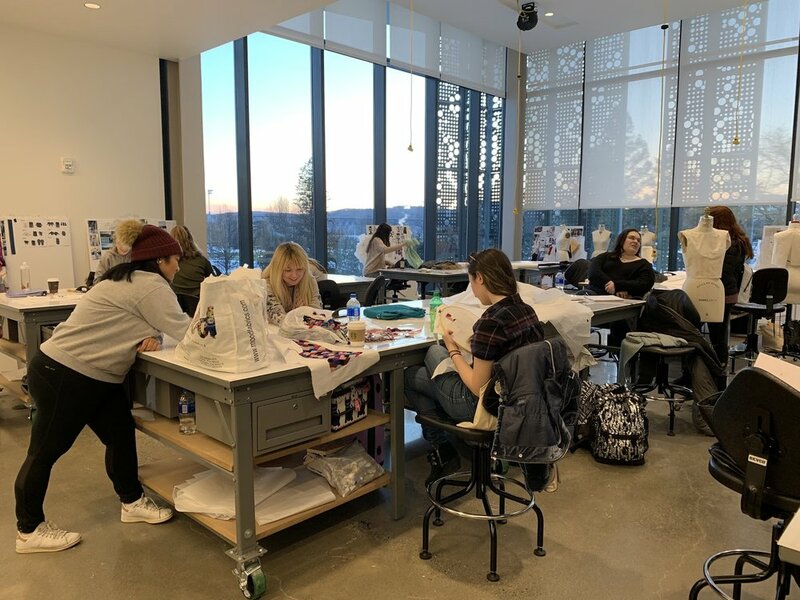 After two years of hard work and patience, members of the Marist community came together Friday evening for the grand opening of the Steel Plant Studios--the new home to many fashion and art classrooms. The Winter Garden, or the courtyard-esque cafe area of the new building, was filled to the brim with spectators, ranging from students and faculty to board members, alumni, and politicians. Marist President David Yellen kicked off the ceremony by thanking some of the people and organizations who brought the Steel Plant building to fruition. He praised Robert A.M. Stern Architects, the architecture firm that designed the Steel Plant. Stern has been responsible for several important Marist structures, including the entry gateways, the tunnel beneath Route 9, and Hancock Center. The new Steel Plant Studios building is designed to match these other buildings. It boasts an industrial-modern style, and incorporates brick, steel, polished concrete, terrazzo, corrugated metal, and tile. President Yellen lauded the new technology in Steel Plant, and emphasized how it will allow students to explore new creative avenues. “This building will add to our student success in many ways, better preparing them for internships and ways in which fashion, art, and technology intersect,” Yellen said. Fashion students gather in the Steel Plant’s open rooms. Photo by Mary Ceniza ‘19. The Steel Plant did not come without its share of expenses. Yellen noted in his speech that Marist received a $3 million grant from the State of New York to complete the project. Ed Smith, Marist’s Art Gallery Director, is also looking forward to seeing what the students can accomplish with this new space. “Space is everything, and the ability to sit there and focus is really important,” Ed Smith said. Smith believes the students’ work is paramount, and that Marist is setting its students up for success by giving them more space to work. But while administrators emphasized expansion as the Steel Plant’s crown jewel, some art students felt the space was largely limited to fashion, with the art rooms compartmentalized in the back corner of the first floor. “She’s a beauty but she needs some editing here and there on the space issues..” said Maggie Alleva, senior art student. “..specifically art classroom space [for capping],” her friend, Gabby Ruiz, joined in. “We’re in the corner,” Ruiz said, adding that she hopes to see improvements to the digital art classrooms. Alleva and Ruiz’s sentiment was reflected in the conglomeration of art students who attended the opening, many of whom expressed frustration with the Steel Plant’s label as a fashion building. “This is our home too,” one student said after recalling an unwelcoming encounter with a “fashion lady” while touring the upstairs of the building last semester. Nonetheless, the students were content with the ceremony itself. “I was very pleased with the representation that art got in the speech. I didn’t expect it,” Alleva said. The renovation project expanded on the original 12,000 square feet with a two story, 35,000 square foot addition. Steel Plant Studios now has two floors and six different labs, including a textile design lab, a fashion digital lab, and a printmaking lab. Steel Plant also features a dining center in the Winter Garden, which President Yellen described as part of Marist’s efforts to distribute dining options to more buildings on campus. Smith noted that there will be a faculty exhibition opening at Steel Plant within the next two-to-three weeks, but for now, it appears that the faculty is more excited about the students’ work than anything else. Mary Ceniza ‘19 contributed to this report.